Naturally, I’m a big fan of juicing and smoothies but sometimes the food addict in me just wants to eat something- as opposed to drink. Confession time – yes, I’m one of those people who treat liquids as “not counting”. Liquid calories, however, do add up and FAST! Luckily, I’m not a soda, sports drink or juice user. That’s right.. user! As you probably heard by now, the same receptor sites light up in the body when sugar hits it as does cocaine. I have even heard that sugar is 8x more addicting. I avoid sugar the best I can but right now I’m talking about eating.. some vegan protein powder actually.. as opposed to drinking it. This idea and recipe that I stumbled on is not to replace my super healthy vegan shakes but rather as an occasional option to basically “switch it up”. I came across these little “protein balls” at a Holistic Health Bazaar not too long along. I set out to do the recipe but then didn’t particularly care for a few ingredients nor the use of a microwave. I began to look further for another recipe- something a bit more simple and closer to raw. 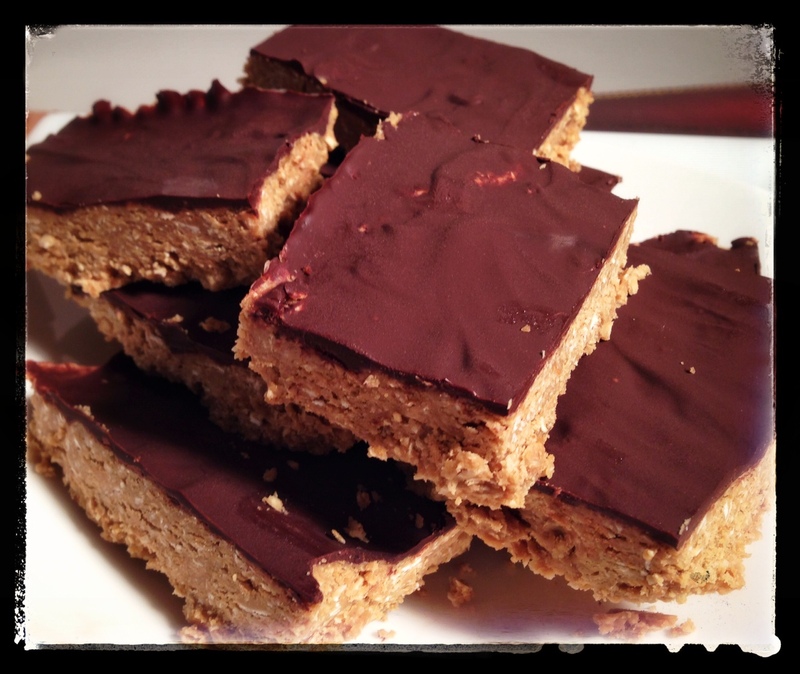 The idea here was to be able to make a “protein” bar as opposed to a shake. I came across a recipe on one of my favorite sites: ohsheglows.com This sounded more like what I was looking for- except, if only I can learn the swirl factor. How she swirled the chocolate on top so beautifully. Oh She Glows- that’s right! I made the bars and thoroughly enjoyed them for a few days. These were perfect for me- a vegan on the go! Of equal importance, the addict in me was satisfied and I found a way to break up the daily smoothies and still get my vegan protein addition in. The best part of this experience though was the “Grama’s cooking” recipes and memories that came up. If I dropped the protein powder and oats, I would have the vegan version of my Grama’s famous chocolate peanut butter squares. These would arrive in my college care packages back in the day which brought friends from all the dorms over for some good ol’ fashion homemade treats. Go Grama! This time though, I’ll hold on the sugar and extra weight and raise ya on the protein! A perfect example of Reinventing Indulgence! I first put the oats in my magic bullet to grind them down quite a bit. In a large mixing bowl, I mixed the oats, protein powder, crunched up amaranth flakes and sea salt. Then I added the maple syrup and peanut butter – both of these healthier brands and not junk varieties. I greased a square pan and pressed the mixture in. Afterwards, I put this pan in the freezer for 10 minutes. Meantime, I melted down the delicious vegan chocolate chips. I tried to drizzle it on like the original photo from Oh She Glows but that didn’t go over well. I ended up covering the whole tray in chocolate – not a horrible thing for a vegan chocolate lover. Back into the freezer they went to set and then I kept them in the refrigerator. Enjoy!